Leukocyte Transmigration Assay | Cell Biolabs, Inc.
Cancer cell transmigration, particularly extravasation, is an important step in cancer metastasis. It is the final step in a cascade of interactions between cells and the endothelium. CytoSelect™ Leukocyte Transmigration Assay provides a robust system for the quantitative determination of transmigrations and interactions between endothelium and leukocytes. Migratory cells may be quantified on a fluorescence plate reader. Kits use 24-well plates with 3 µm pore size membrane inserts. Figure 1: The Leukocyte Adhesion / Transmigration Cascade. 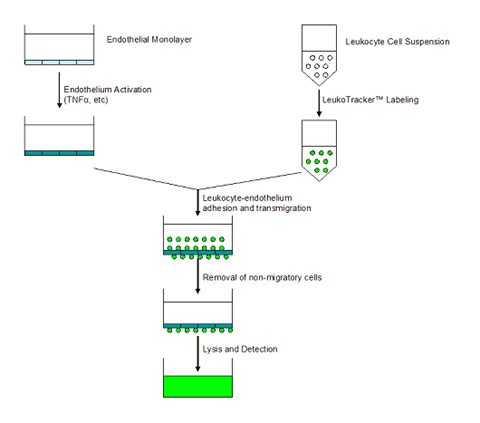 Figure 2: CytoSelect™ Cell Transmigration Assay Principle. Patra, H. K. et al. (2016). Inflammation-sensitive in situ smart scaffolding for regenerative medicine. Nanoscale. doi:10.1039/C6NR06157E. White, J. et al. (2016). VLA-4 blockade by natalizumab inhibits sickle reticulocyte and leucocyte adhesion during simulated blood flow. Br J Haematol. doi:10.1111/bjh.14158. Roberts, L. L.& Robinson, C. M. (2014). Mycobacterium tuberculosis infection of human dendritic cells decreases integrin expression, adhesion and migration to chemokines. Immunology. 141:39-51. Giunzioni, I. et al. (2014). Cigarette smoke condensate affects monocyte interaction with endothelium. Atherosclerosis. 234:383-390. Roe, K. et al. (2014). West Nile virus-induced cell adhesion molecules on human brain microvascular endothelial cells regulate leukocyte adhesion and modulate permeability of the in vitro blood-brain barrier model. PLoS One. 9:e102598. Yang, H. and H.E. Grossniklaus (2010). Constitutive Overexpression of Pigment Epithelium Derived Factor Inhibition of Ocular Melanoma Growth and Metastasis. Invest. Ophthalmol. Vis. Sci. 51:28-34 (#CBA-216). Fava, G. et al. (2008). Leptin Enhances Cholangiocarcinoma Cell Growth. Cancer Res. 68:6752-6761 (#CBA-212). Zhao, L. et al. (2008). CD44 Expressed on Both Bone Marrow-Derived and Non-Bone Marrow-Derived Cells Promotes Atherogenesis in ApoE-Deficient Mice. Arterioscler. Thromb. Vasc. Biol. 28:1283-1289 (#CBA-212). Liu, K. et al. (2007). Lentivirus Mediated Gene Transfer of PEDF Results in Decreased Uveal Melanoma Transendothelial Migration. Invest. Opthalmol. Vis. Sci. 48:5244 (#CBA-216).